Paris, March 5th − La Quadrature du Net thanks the tens of thousands of citizens in France who are relaying the “black-out”1http://www.laquadrature.net/fr/APPEL-HADOPI-blackout-du-net-francais. and are being engaged in a huge information campaign on the issues of HADOPI/”Olivennes” law2http://www.laquadrature.net/HADOPI. (implementing the “graduated response” or “three strikes”). The examination of the law at the National Assembly is expected to begin on March 10th, a date that will represent the pinnacle of the campaign. La Quadrature calls on citizens to take action by asking their MP to take a stand in the parliament and to vote for amendments that expose violations of rights in this idiotic law. La Quadrature du Net has just published a “blackout guide“3http://www.laquadrature.net/fr/guide-du-blackout-HADOPI. clarifying the issues and the goals of this citizen campaign for information and awareness of the people’s representatives. It also provides tools to easily pass round this information through websites, blogs and social networks. “The “blackout” reveals the extent of the rejection of the law, that goes way beyond political divides. The stakes of the “graduated response”, its dangers and its unjustifiable bases are spreading out on hundreds of thousands of sites, blogs, posts on forums and social networks, etc. Everywhere, people are discussing on this archaic law. We shall meet our representatives with serenity, their awareness must be raised, and we must intensify actions until the final vote of the law in the Assembly” says Jérémie Zimmermann, spokesperson for La Quadrature. A “black-out gallery”4http://www.laquadrature.net/HADOPI-blackout-gallerie. 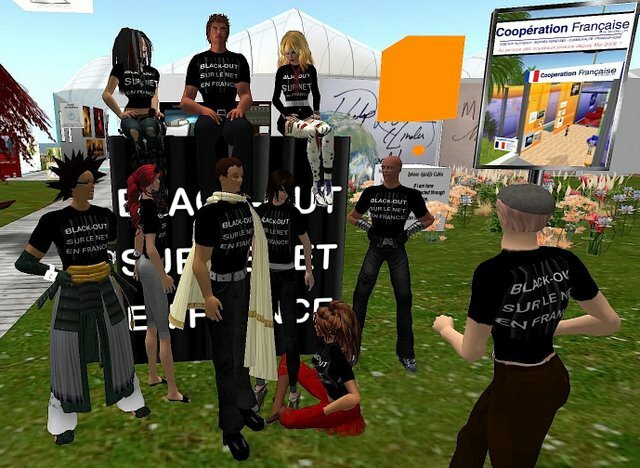 is also online and presents a sample of thousands of sites and avatars painted black, selected among the tens of thousands that can be found by search engines 5Almost 300.000 results are found with a Google search on “black-out hadopi” or “blackout hadopi”: http://www.google.fr/search?as_q=+hadopi&as_oq=black-out+blackout.. These can give an idea of the inventiveness and diversity shown by the actors of a network the government tries desperately to repress. « The work of MPs who are seriously examining the text already showed such a collection of abuses to fundamental rights that the only reasonable solution would be to massively reject it during the vote on the inadmissibility exception and the preliminatry question6procedural steps which would take place before the consideration of the law... » says Philippe Aigrain, co-founder of La Quadrature. point out that, like many other Internet users, they will watch the plenary session live on the Internet and will analyse votes8An analysis of the amendments is underway: http://www.laquadrature.net/wiki/Hadopi_amendements_assemblee_nationale. ; ask them for session tickets to attend the debates at the National Assembly9The session is much more interesting on site than on the Internet, especially because of its “off field” action. To easily follow the debates, La Quadrature will soon set up a “yellow sheet” on the HADOPI dashboard: http://www.laquadrature.net/HADOPI..
« Thanks to the actions of the citizens, the debates will prove the dangers of that arbitrary HADOPI and the absurdity of its repressive logic. It is important to show to MPs that we are watching what they say and how they vote, to remind that to them when HADOPI will crumble under its own weight. If fundamental rights violations remain in the text, the only solution will be rejection. This text is already outdated and will never be able to stop culture and creation from enriching itself by sharing. », Zimmermann concludes. 5. ↑ Almost 300.000 results are found with a Google search on “black-out hadopi” or “blackout hadopi”: http://www.google.fr/search?as_q=+hadopi&as_oq=black-out+blackout. 6. ↑ procedural steps which would take place before the consideration of the law. 7. ↑ La Quadrature provides a guide explaining how to contact a deputy : http://www.laquadrature.net/wiki/HADOPI_contacter-son-depute_HOWTO. 8. ↑ An analysis of the amendments is underway: http://www.laquadrature.net/wiki/Hadopi_amendements_assemblee_nationale. 9. ↑ The session is much more interesting on site than on the Internet, especially because of its “off field” action. To easily follow the debates, La Quadrature will soon set up a “yellow sheet” on the HADOPI dashboard: http://www.laquadrature.net/HADOPI.